By the first half of the 17th C, the copper coinage in both Britain and Ireland was in complete disarray. Neither James I nor his son, Charles I, took much interest in providing small denominations and ‘farmed out’ the Royal prerogative of minting copper coins to ‘favourite’ courtiers as patentees – Lords Harington, Richmond, Lennox and Maltravers were the principal recipients of these royal favours, but few of these new copper coins seem to have reached Ireland. So after the civil war, with the Royal Perogative removed and an essential need for a small a copper change to facilitate the day-to-day financial transactions of ordinary folk, merchants, innkeepers and city authorities started to make their own pennies, halfpennies and farthings. Trade tokens undoubtedly filled a need, but they could only be regarded as treating a symptom, not solving a problem – the kings of England felt the production of copper coinage was beneath them and local commerce at small trader level suffered. During the Interregnum, little changed insofar as the no copper coinage was issued for use in Ireland. Early 17th C Irish tokens are very different from those of England – usually being of a smaller size in proportion to their value, e.g. many of the pennies are no larger than English farthings. For this reason, collectors often refer to them as trade farthings – despite the fact that most of them are pennies. In addition to the size difference, the business of the issuer is commonly expressed by the word MERCHANT, which is rarely found on those of England. Two proclamations were issued in 1661, prohibiting the issue of tokens and this probably accounts for the comparative rarity of the dates 1660, 1661, and 1662. Despite Sir Thomas Armstrong being one of Ormonde’s most trusted officers during the Great Rebellion of 1641, James Butler, (Duke of Ormonde) obtained a ‘king’s letter’ from Charles II granting him sole authority to suppress all tokens in Ireland that did not have his approval. This effectively prevented Armstrong’s farthings from circulating freely in Ireland and, Armstrong’s death in 1662 would have halted production entirely. Shortage of copper coin in Ireland continued to be a problem. By 1663 the tradesmens’ tokens seemed to have been issued as prolifically as before but were discontinued after 1673 when, on October 17, another proclamation from the king forbade anyone to issue them without license from his Majesty – this seems to have stopped their circulation. As such, the numismatic history of 17th C Ireland can be seen as a series of shortages. The first person to attempt to catalogue these 17th C tokens was Dr Aquilla Smith, Proceedings of the Royal Irish Academy (1836-1869) Vol. 4 (1847 – 1850), pp. xxvii-liv. Dr Aquilla Smith (1806–1890), was an Irish antiquary. He was born at Nenagh, co. Tipperary, on 28 April 1806, was the youngest child of William Smith of that town, and of Catherine Doolan, his wife. He received his education first at private schools in Dublin, and afterwards at Trinity College. He embraced the medical profession, in which his career was distinguished. He received the degree of M.D. 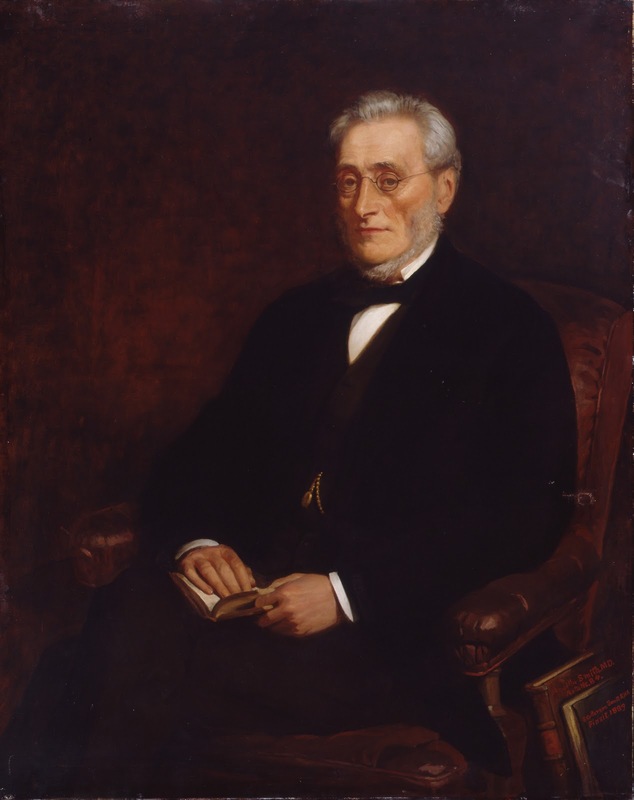 honoris causa from his university in 1839, was king’s professor of materia medica and pharmacy in the school of physic from 1864 to 1881, and from 1851 to 1890 represented the Irish College of Physicians on the council of medical education. Smith was an active member of the Royal Irish Academy from 1835 until his death in 1890, and was reckoned in his lifetime the best authority on Irish coins, of which he was a large collector. At his death his collection of Irish coins and tokens was acquired by the academy for £350. The Numismatic Society acknowledged his services by conferring its medal upon him in 1884. Smith was a copious writer on antiquarian subjects, mainly numismatics. After Dr Smith, William Boyne attempted a British catalogue in the 1850’s. He was one of the greatest English coin collectors of his day and did much original research into his chosen field. Obviously, as a first attempt at the subject, Boyne’s works could not have included the many hundreds of tokens not yet found in 1858 or not yet correctly attributed to tradesmen. His work, therefore, has been added to over the years – both piecemeal (local studies) and as a complete revision by later experts in the field. 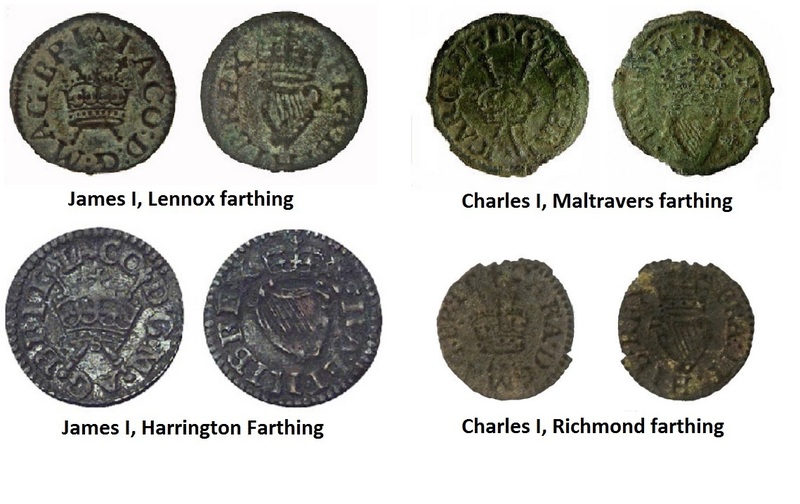 Some of these later works ‘brushed over’ previous research on the Irish tokens and did not really add much to the volume of knowledge due to the fact that they (and their readers) were mostly interested in the English tokens. The Token Book, by Paul & Bente R. Withers (Galata, 2010) is another attempt at updating the pool of knowledge but they seem to have limited their Irish section to only those tokens they could find an image of – therefore their Irish section is somewhat short of what might have been expected. Although manufactured and used over 350 years ago, many of these tokens were issued with pretty much the same form of English as we use nowadays, with a few notable exceptions to their alphabet and spelling, e.g. In addition to the above, spelling had not yet become standardised, so placenames and personal names are sometimes recorded in a number of forms, e.g. CORK and CORKE are the same place and no single version was deemed correct at the time – the placenames and tradesmens’ names only needed to be understood by the locals. Perhaps some represent the phonetically correct spelling according to local accents at the time. All thirty-two counties issued them except Mayo; Co’s Clare, Fermanagh and Leitrim have only one each whereas the city of Dublin issued one hundred and fifty – about 20% of the entire range. It is not easy to list them by county since several towns or cities now occupy ground in more than one county, e.g. Belfast is in both Antrim and Down, Limerick is in both Limerick and Clare, and Athlone occupies land in both Westmeath and Roscommon. Most collectors are familiar with this, so a change might only be confusing. Little is known about who issued them, since most were just small traders and people like them usually don’t get a mention in history. Where possible, I have added scraps of information gleaned from local histories and local archaeological socieites. These notes appear as purple-coloured italic text. I am publishing this information on the web so as to encourage more people to collect these scarce coins. Expensive, paper-based catalogues do not encourage people to collect, i.e. their high prices are actually a barrier to new collectors. In addition, paper-based publications are not easily updated and, I believe, the expense of producing and purchasing updated versions is also a barrier to new collectors. Excellent. Can’t wait to read your forthcoming pages on Ireland’s C17th tokens!